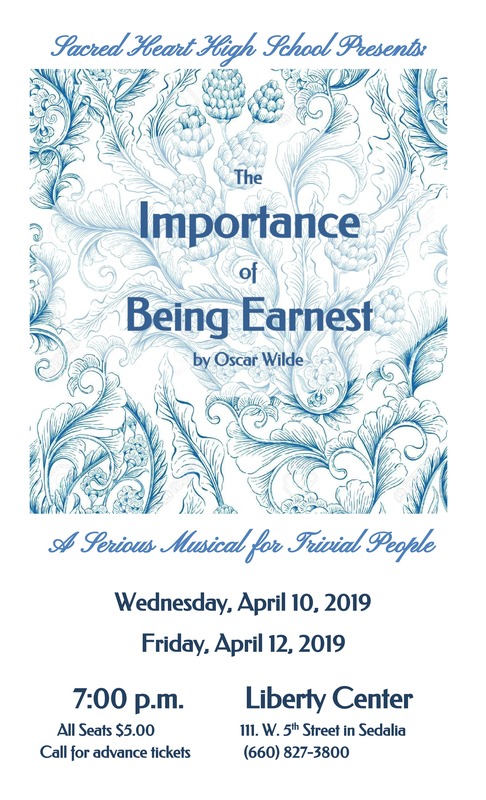 Sacred Heart High School is proud to present our own musical adaptation of Oscar Wilde’s endlessly entertaining comedy The Importance of Being Earnest. Audiences of all ages will appreciate an unmissable opportunity to see what the London Telegraph calls “the most perfect comedy in the English language.” The Importance of Being Earnest will run Wednesday, April 10 and Friday, April 12 at 7:00 p.m., at the Liberty Center in downtown Sedalia. Tickets for all seats cost just $5.00 — call the school office at 827-3800 to reserve advance tickets. Oscar Wilde’s wildly entertaining comedy sparkles with dazzling wordplay and hilariously unlikely situations, sprinkled with songs from the Ragtime era. This “trivial musical comedy for serious people” features two carefree bachelors, Jack, and Algernon, each with a carefully hidden double life. But when Algernon discovers that Jack has been posing as a man named Ernest to escape to the city, he promptly travels to Jack’s country estate to pose as the fictional figure himself! Silliness ensues with whimsical ingénues, jealous fiancées, indomitable dowagers, and the most famous handbag in theatre history. The cast features Summer Caton (Gwendolen Fairfax), Donavan Dobson (Lane), Mariah Van Leer (Lady Bracknell), Alyssa Perez (Cecily Cardew), Jaxon Beeler (Algernon Moncrieff), Cody Damlo (Rev. Canon Chasuble), Olivia Dobson (Mary), Addie Hunsaker (Miss Prism), and Joseph Henke (John “Jack” Worthing). The creative team is led by Jan Bahner (stage direction) and Darrin Hartman (music direction).